1. Lose Weight/Start Exercising/Eat Healthy Food: The mitzvah of saving a life (pikuach nefesh) is so great that it precedes most other mitzvot. This means one's own life as well. Taking care of one's personal health, whether that means eating a healthier diet, exercising or even making certain to go for an annual check-up, is part of the mitzvah that the sages connect to the commandment of Deuteronomy 4:15 - "And you shall watch yourselves very well." Judaism has always placed great emphasis on taking care of the world, because the world was created by God. An important component of the Jewish view of the universe is that God did not need to create humankind, that our very existence is a gift that comes with a responsibility. The sages inform us that "When the Holy One, blessed be God, created the first human...God said to Adam, 'See my works how good and praiseworthy they are? And all that I have created I made for you. [But] be mindful then that you do not spoil and destroy My world - for if you do spoil it, there is no one after you to repair it'" (Ecclesiastes Rabbah 7:13). People do the most damage to each other with their mouths. Damage done with our hands, such as injuries, thefts, etc, can usually be repaired. Words, however, are like feathers in the wind--they fly too fast to catch and can never be retrieved. Jewish law regards lashon harah, wicked speech such as gossip and slander, as one of the worst of the transgressions that one may commit against fellow humans. Ideally, people should have no qualms about supporting those in need. The Torah, however, recognized that charity is not necessarily a natural instinct and, therefore, mandates the giving of tzedakah (charity) of 10% of a person's income. Ma'aser, which means a tenth (often translated as "tithe"), is the specific name given for the allocation of one's tzedakah. In ancient times, each Jew was required to give one tenth of the produce of the fields to the Levite, and an additional tenth to the poor or to support Jerusalem. Today, ma'aser is generally given from both one's regular income and from any additional monies that come to a person, such as bank interest, an inheritance or a monetary gift. Because of the intricacies of the laws and differences in situations, it is recommended that one seek the help of a qualified rabbi to properly allocate one's ma'aser. This Treat was originally posted on December 31, 2012. Add a Jewish goal to your resolutions. There have been few Jews included among the peerage of the United Kingdom, and only one who was awarded the title of Marquess. Sir Rufus Daniel Isaacs, the Marquess of Reading, was born in London in 1860. His family was in the fruit business, but, at 16 years old, Isaacs went to sea as a ship’s boy for two years. Next he tried to make his fortune on the London Stock Exchange. When he ran out of funds in 1884, he began studying law and was called to the bar in 1887. Combining his new legal knowledge with his commercial experience, Isaacs had found his niche. Isaacs made numerous diplomatic missions to the United States and spent a year as the United Kingdom’s Ambassador in Washington in 1918. In 1921, Sir Isaacs was appointed Viceroy of India. He later served briefly as foreign secretary. In 1910, Isaacs was knighted by King George V. In 1914, he was made Baron of Reading, which was changed to Viscount in 1916 and Earl in 1917. In 1926, Isaacs was titled Marquess of Reading, the highest title in the British peerage ever attained by a Jew. Sir Isaacs took personal interest in the British Mandate of Palestine and involved himself with several Zionist projects. Most significantly, he was one of the founding members of the Palestine Electric Corporation, which later became the Israel Electric Company. Rufus Isaacs, 1st Marquess of Reading, died on December 30, 1935. Copyright © 2015 NJOP. All rights reserved. Find a quiet time in the evenings to express your gratitude for the good things in your life. When the First Temple was destroyed., most of the Jews in Israel were exiled to Babylon. Even when the Jews were allowed to return, only about 40,000 Jews returned to the Holy Land. When the Temple was rebuilt and there was some level of autonomy, most of the Jews remained in Babylon. In time, Babylon became the home of many renowned scholars, and it was in that location that the famed Babylonian Talmud was compiled. During the hundreds of years that the Jews inhabited Babylon, the head of the Babylonian Jewish community was known as the Reish Galuta, which literally translates to “Head of the Exile.” In English, however, the position is usually referred to as the Exilarch, and sometimes as the “Prince of Captivity.” The princely title refers to the fact that the exilarch was a hereditary position passed from father to son. Jewish tradition states that the position began with the sons of Jeconiah, the deposed king of Judea who was imprisoned by Nebuchadnezzar for over 40 years. Being descendants of Jeconiah meant that the exilarchs were of the Davidic royal line. The relationship of the exilarch and the Babylonian scholars varied. Some of the exilarchs were, themselves, great scholars. Others tersely tried to assert their control over the scholars. Similarly, the exilarchs had varying degrees of success in their relationship with the government of the land (which itself changed over time). One noted low point, recorded by Rabbi Sherira, was under the rule of Jezdegerd II and his son Peroz, who persecuted both Jews and Christians. On the 18th of Tevet 4231 (470 C.E.). Peroz executed the exilarch Huna (V) Mori, the son of Mar Zutra (along with Rav Mesharshia bar Pekod). The office of the exilarch outlasted numerous empires that conquered the Babylonian region. The position remained even after the Muslim conquest in the 7th century. The last exilarch is listed as David ben Zakkai, who died in 940 C.E. Be supportive of the local leaders trying to strengthen the Jewish community. In honor of Iowa’s entry into the United States of America as the 29th state on December 28, 1846, Jewish Treats presents a brief biography of the area’s first Jewish resident, Alexander Levi. Levi was born in Hellemere, in the Alsace region of France, in March 1809. He arrived in America via New Orleans when he was 24 years old, and immediately headed north into what was then known as the Wisconsin Territory. Settling in the newly incorporated city of Dubuque, Levi opened a grocery store. It was the first of what would be for him a string of successful business ventures. Eventually, Levi was known as a grocer, a miner (both of lead and gold), a mine provisioner and a department store owner. In 1837, Levi had the unique distinction of becoming the first foreigner to be naturalized in the Wisconsin Territory. That same year, he also became the first mason to be sworn into the new Dubuque lodge. From the perspective of a Jewish religious and social life, living in the territories was difficult. In 1847, Levi returned to France in order to marry. He returned with his wife Minette, and they had five children born and raised in Dubuque. By 1857, there were enough Jews in town for Levi to help organize the Bnai Jeshrun Congregation. He also donated 20 acres of his own land for a Jewish cemetery. Alexander Levi passed away in March 1893. A special obelisk marks his grave as an honor to the first Jew in Iowa. If you have extra days off, visit a senior center and spend time with those who have no family. In Judaism, the day begins and ends at sunset. But defining sunset can be complicated. However, for many aspects of Jewish life, such as the observance of Shabbat/holidays, prayer times and even the day on which a baby boy has his brit milah (circumcision), knowing the exact moment when one day turns into the next is essential. There is, therefore, much discussion among the sages as to when day becomes twilight and twilight becomes night. This time period is known in Hebrew as bein ha'shma'shoat, between the suns. As long as there is any trace of sunlight left, it is still twilight. According to the Talmud (Shabbat 34b): "From sunset on, as long as the eastern sky has a reddish glow, then, when the lower horizon is dark, but not the upper horizon, it is twilight; but when the upper horizon is as dark as the lower, it is night, so says Rabbi Yehudah. Rabbi Nechemiah says: [Twilight begins at sunset and lasts] as long as it takes a person to walk half a mil (.35 miles). Rabbi Yose said: Twilight is like the blink of an eye--the night comes and the day goes, and it is impossible to fix the exact time." Bein ha'shma'shoat is an interesting time in Jewish law and Jewish lore. For example, certain leniencies in Shabbat observance are allowed during bein ha'shma'shoat on Friday (e.g. one may directly ask a non-Jew to perform an act prohibited for Jews on Shabbat or one may separate certain tithes). In Jewish lore, according to Ethics of our Fathers (5:8), a number of mystical symbols such as the rainbow, manna from heaven and Moses' miraculous staff, were created during bein ha'shma'shoat before the first Shabbat. This Treat was last posted on February 8, 2010. Enjoy a long, slow Shabbat dinner tonight. Nissim Ezekiel was an Indian poet who brought a unique voice to his literary contributions. Born in Bombay, India, on December 24, 1924, he was educated in both India (University of Bombay - now University of Mumbai) and England (Birkbeck College, London). He returned to India shortly after the country achieved independence (1947) and chose to write in English rather than in an Indian language. Ezekiel’s most unique attribute, however, was that he was a member of one of India’s ancient Jewish communities, the Bene Israel. Ezekiel’s first book of poetry, Time to Change, was published in London in 1952. Publishing poetry, however, is not particularly lucrative. In order to return home to India, Ezekiel worked as a deck-scrubber on a cargo ship carrying arms to Indochina. In India, he continued to write and publish poetry, but also held a series of other literary positions, such as art-critic for the Times of India, and taught at several foreign universities. Ezekiel received the Sahitya Akademi Cultural Award in 1983 and the Padma-shri, India's highest civilian honor, in 1988. Nissim Ezekiel passed away on January 9, 2004. If you have time off for the legal holidays, use the time to participate in mitzvot like visiting the sick or helping the less fortunate. The deathbed confession is a classic cinematic moment. It is often at this dramatic climax that past evils are revealed, forgiveness is granted and tears are shed. Hopefully, most people don’t have many serious misdeeds weighing on their conscience at the time of death, but the concept of confessing before dying is an important one in Jewish tradition. While the term vidui (confession) is most familiar to people from the public confessional on Yom Kippur, there is a similar confessional prayer for those on their deathbed. The primary difference is that on Yom Kippur, the vidui is communal and is recited in plural form, as opposed to the singular form of the personal deathbed confession. One can, of course, add one’s own words to the confession and it may be recited in one’s preferred language. Final deathbed statements can be found throughout the Torah. Of them, the most memorable occurs when Jacob blesses his 12 sons and prophetically alludes to the character of the tribe they will become. Confession is mentioned in the Talmud, and the Code of Jewish Law specifically states: “Many have confessed but have not died; and many who have not confessed died. And many who are walking outside in the marketplace confess. By the merit of your confession, you shall live. And all who confess have a place in the World-to-Come”(Shulchan Aruch Yoreh Deah 338:1). If the ill person is unable to recite vidui, it may be said by someone else. After vidui and the Shema have been recited, it is customary not to leave the ailing person alone until they pass or, with God’s help, recover. Don't wait to repent for a misdeed if you recognize that you have done something wrong. 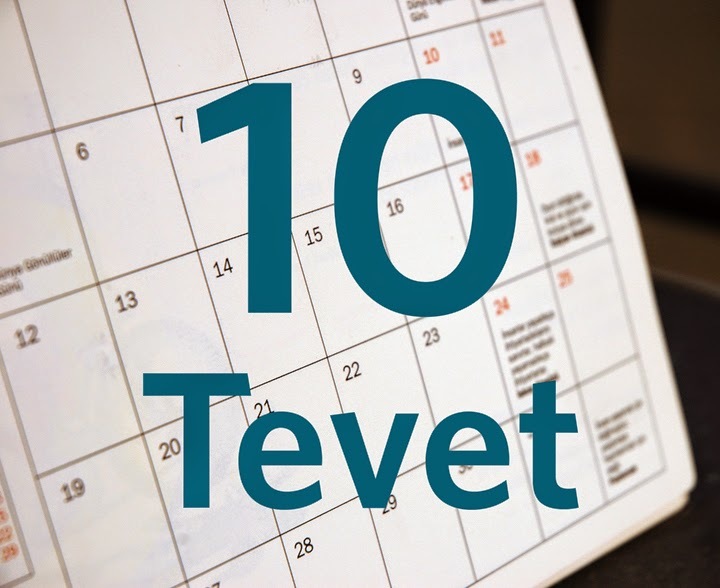 Today, the tenth of Tevet, is a fast day that commemorates the beginning of the Babylonians’ final siege on the city of Jerusalem, which served then as the capital of the Kingdom of Judea. Jews fast on this day because this siege marked the beginning of the end, leading to the destruction of the Holy Temple and the long exile in Babylon which followed. It was not, however, the first Babylonian siege of Jerusalem. Approximately 10 years earlier, Nebuchadnezzar took issue with the faltering loyalty of Judea, which was then a Babylonian tribute state. After King Johoiakim died in Nebuchadnezzar’s captivity, Nebuchadnezzar allowed Johoiakim’s 18 year old son Jeconiah (also known as Johaiachin) to assume the throne. When he returned to Babylon, however, his advisors said to him: “The saying goes, ‘Do not rear a good puppy born to a bad dog.’ How much more so a bad puppy born to a bad dog.” (Leviticus Rabbah 19:6). Therefore, Nebuchadnezzar laid siege to Jerusalem in order to depose the new king. To end the siege (which was not very long, given that Jeconiah reigned only 3 months), Jeconiah gave himself to Nebuchadnezzar who then also took with him to Babylon Jeconiah’s mother, wives, officers and the chief men of the land. “Ten thousand captives and all the craftsmen and the smiths; none remained save the poorest sort of the people of the land (II Kings 24:14). Nebuchadnezzar also took the treasures from both the temple and the king’s house. Before leaving, Nebuchadnezzar crowned Jeconiah’s uncle and renamed him Zedekiah. Although the Torah specifically states that Jeconiah “did that which was evil in the sight of the L-rd” (Ibid., 24:9), Jewish tradition infers that he repented his ways while imprisoned in Nebuchadnezzar’s prison. Jeconiah did not die in prison. After the ascent of Evil-Merodach, Nebuchadnezzar’s son, Jeconiah was released and treated with the respect owed to a fellow king. When you break your fast, eat slowly for better health. And it was in the ninth year of [King Zaddekiah’s] reign, in the tenth month, on the tenth (day) of the month, that Nebuchadnezzar, King of Babylon, came, he and all his legions, upon Jerusalem, and encamped upon it and built forts around it. And the city came under siege until the eleventh year of King Zaddekiah. On the ninth of the month [of Tammuz] the famine was intense in the city, the people had no bread, and the city was breached (The Second Book of Kings 25:1-4). Siege! The word itself resonates with pain and suffering. In the case of the siege of Jerusalem by the Babylonians (in 588 B.C.E. ), it was also the beginning of the end. Having just vanquished the great Assyrian empire, the Babylonian king, Nebuchadnezzar, sent his troops to quell any rebellion in the land of Judea, whose heart was the city of Jerusalem. The siege lasted for a year and a half. During this time, the city suffered immensely. Starvation, thirst, disease...all the horrors of siege were borne out, just as had been predicted by the prophet Jeremiah. The great sages declared the Tenth of Tevet, the day that the fateful siege began, as a fast day from sunrise to nightfall, to provide a time for people to reflect on their actions and do teshuva (repentance). This year, the Tenth of Tevet is tomorrow, December 22, 2015. This Treat is posted each year before the fast. Prepare for the fast by drinking extra water today. There is a great deal of gift-giving going on at this time of year. 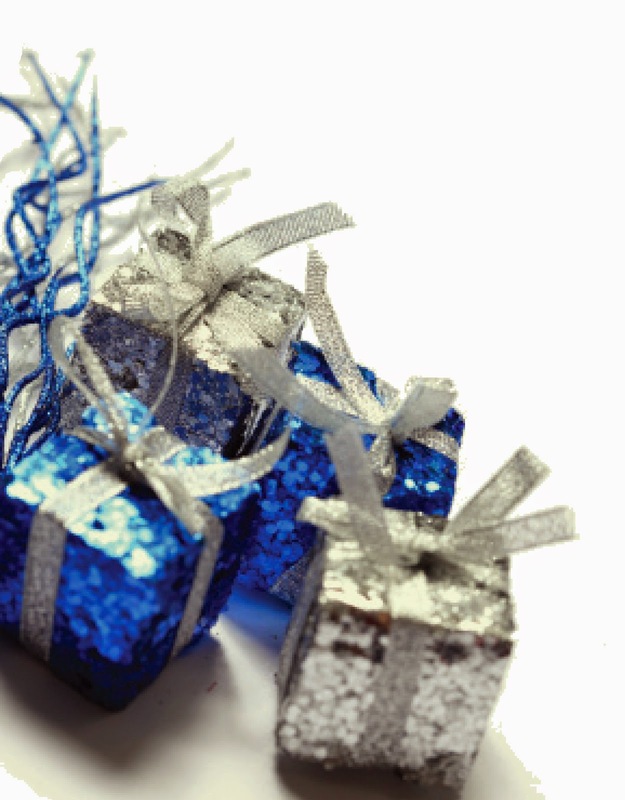 Beyond friends and family, many feel obligated to give end of the year gifts to local specialists (such as one’s hair stylists). For those who work in the corporate world, there is even greater pressure, especially with the need to be conscious of office politics and hierarchies. Certain standard gifts, such as chocolates, a fancy cheese platter or a bottle of wine or liquor, take the stress out of choosing a gift. These choices, however, are not always as straight-forward as they seem. First and foremost, if a gift is being sent to another Jew, the gift should be kosher. What might be more surprising is that this “kosher-factor” may also apply in giving a gift to non-Jewish colleagues as well. While Jews are not supposed to consume non-kosher food or wine, there are also laws guiding the way in which one may benefit from such products. For instance, one is permitted to use non-kosher meat to provide a healthy diet to a pet, but selling that same non-kosher meat may be problematic. One does not often think of the receiving benefit of giving holiday gifts because the benefit is so subtle. 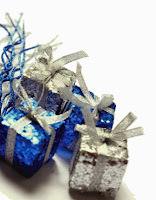 Intentionally or not, one gains good will by participating in the end of year gift giving. Indeed, more thought is often put into the choice of gift for one’s boss than for a co-worker. 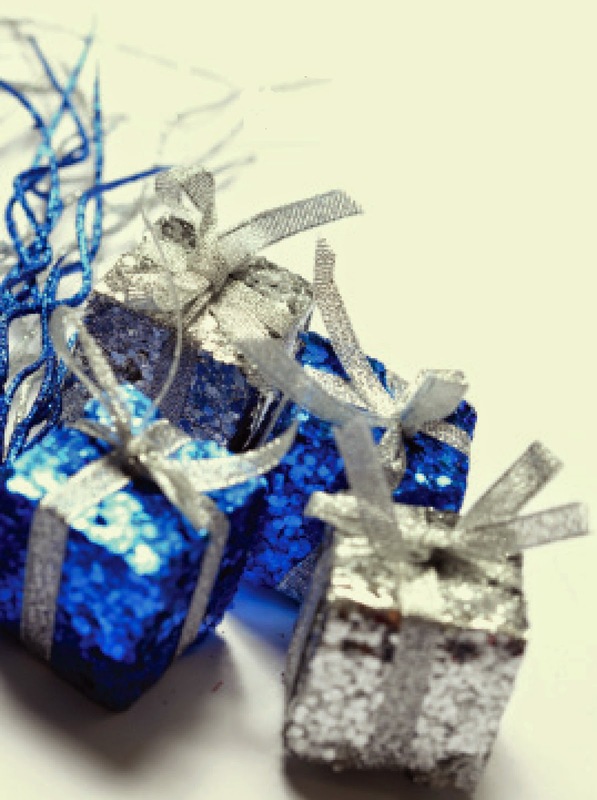 While at first glance the need to avoid non-kosher gifts may appear to complicate the issue, the law only applies to some items, and there are often exceptional circumstances about which one should consult their local rabbi. Also, there are easy replacements. Instead of giving a fancy brandy (which has a wine base), one may choose an upscale, unflavored scotch. * If one is looking to food items, a basket of fresh fruits** is an excellent choice. *A flavored scotch would include scotch aged in a sherry/port/bourbon cask. **Because we are in the year immediately following a shmittah year in Israel, it is recommended that Israeli fruits be excluded from any fruit basket. Take a break, unplug and enjoy the gift of Shabbat. While common sense tells us that generalizations and labelling can be damaging both to individuals and the greater society, it seems to be a fact that politicians sometimes forget that principle. Take, for instance, the time that General Ulysses S. Grant decided that the word “Jew” was interchangeable with the term profiteer. In 1862, Major-General Grant was in charge of the military district that included Tennessee, Mississippi and Kentucky and was responsible for issuing trade licenses that permitted merchants to cross into the south. It was a time-consuming task that frustrated him. While there were certainly many Jews involved in the black market, there were many black marketeers who were not Jewish. There were also many Jews who had settled in the territory prior to the war. The Jews, as a class violating every regulation of trade established by the Treasury Department and also department orders, are hereby expelled from the Department [of the Tennessee] within 24 hours. The orders went into immediate effect and quite a few Jewish families were displaced. Almost as quickly, however, the Jews took political action to stop the deportation. Led by Cesar Kaskel, who had been expelled from Paducah, Kentucky, they went straight to Washington, D.C., and ended up speaking directly to President Abraham Lincoln at the White House. The seemingly anti-Jewish decree was brought up again when Grant ran for president in 1868, but Grant actually received a large portion of the Jewish vote. Some say that Grant was motivated by his hatred of the people who constantly petitioned him for trading rights. On the other hand, many think that Grant simply erred in using general vocabulary and referring to Jews rather than Jewish peddlers. Be honest in all your business dealings, even the one's that seem insignificant. One does not often hear of a decorated soldier from the United States army choosing to move to the German Democratic Party (East Germany under Communist rule). Stefan Heym, however, did just that after he returned his army commission and bronze star as a means of protesting U.S. involvement in the Korean War. Heym, whose real name was Helmut Fleig (Heym being his pen name), was actually a native of Germany. Born in April 1913 in Chemintz, he came to America in 1935 on a scholarship from Phi Sigma Delta, a University of Chicago Jewish student organization. Heym had begun his degree in Berlin, but fled to Czechozlovakia when the Reichstag was burned in 1933. After completing his degree, Heym moved to New York, where he worked on a communist-aligned German language paper. When the paper closed, he freelanced and wrote his first novel, Hostages (which was made into a movie). In 1943, Heym became a member of the Ritchie Boys, the U.S. army’s intelligence and psychological warfare unit. Discharged in 1945, he continued to write until leaving the country. While the political situation in East Germany was tenuous, Heym managed to be both opponent and supporter of the regime. He was a prolific author and, in addition to essays and newspaper columns, published numerous novels, most of which he wrote in English and then translated into German. Jewish themes were prominent in several of his novels, such as The Wandering Jew and The Lenz Papers. A supporter of reunification even before the fall of the Berlin Wall in 1989, Heym was a staunch socialist. In 1994 (at the age of 81! ), he was elected as an independent representative to the Bundestag (German Parliament), only to resign later in protest of increased expense accounts for legislators. On December 16, 2001, while attending a conference in Israel on the poet Heinrich Heine (about whom he had written his Masters thesis), Heym suffered a fatal heart attack. Be firm in your convictions, but willing to hear the opposing argument. The thought of a Caribbean vacation readily arouses lovely fantasies as the cold days of winter set in. Consider, perhaps, a trip to Curacao, where one can enjoy sun and surf and also explore the history of one of the oldest Jewish communities in the Western Hemisphere. The island of Curacao was conquered in 1634 by the Dutch fleet commanded by Johan van Walbeeck, among whose crew members was Samiel Coheno, who served as pilot, interpreter and guide. While Coheno remained on Curacao, the real Jewish settlement there only began in the 1650s, when Joao d’Ylan, a prominent Jew, gained permission to bring a small group of Jewish settlers. The original Jewish community of a dozen families settled a Plantation named “De Hoop”(the Hope), and was supplemented by a second group of settlers in 1659. Although they came from the Netherlands, most of these Jews were refugees from the Spanish and Portugese Inquisitions. Under the control of the Dutch, they were able to openly practice their Jewish faith*, which is why they were joined in their Curacao venture by Jews who had settled in Brazil. Although they did not succeed at farming, the Jewish community was successful in trade. Within a decade of their arrival, the Jews established Congregation Mikve Israel and built their first synagogue building in the city of Willemstad in 1674. By 1732, a larger space was necessary. The new building is still in use today, and it is the oldest synagogue in continual use in the Americas. At its peak, the Jewish community comprised 50% of the European population of Curacao. In the 1860s, a third of the community separated from Mikve Israel to form a Reform community and built Temple Israel. One hundred years later, as the island’s Jewish community began to dwindle, the two synagogues merged to form Mikve Israel-Emmanuel. Today, Mikve Israel-Emmanuel, while still an operating synagogue, is a popular tourist destination (particularly noted for its sand floors meant to muffle sound - a tradition from the days of the Inquisition) and serves as the location of the Jewish Historical Cultural Museum. This Treat was written in honor of December 15, which is a significant date in Curacao history as it is both the date of the 1954 Charter for the Kingdom, which made Curacao equal to the Netherlands, and the date on which its autonomy was voted for in 2008. *They did run into some resistence from the governor of the New Netherlands, Peter Stuyvesant, who felt that the Jews were given unfair advantages over other settlers. Be proud of the history of the Jewish community where you live. The events of Chanukah took place about 150 years after the death of Alexander the Great (323 BCE), which brought 40 years of civil war to his empire. Eventually, the empire was divided into 3 smaller empires: the Antigonid Empire in Greece, the Selucid Empire in Mesopotamia and Persia, and the Ptolemaic Kingdom in Egypt, Judea and Cyrenaica (Libya). By the time Antiochus IV Epiphanes assumed the throne of the Selucid empire in 175 BCE, Judea was under Selucid control. He began his oppression of the Jewish people in 167 BCE, after his attempt to conquer Egypt was thwarted by threats from Rome. Antiochus's initial anger at the Judeans was for the ousting of Menelaus from the office of High Priest, to which Antiochus had appointed him. The Maccabees redeemed Jerusalem and re-dedicated the Holy Temple in 165 BCE. While they won religious freedom, the Jews never completely regained their political independence. Jewish kings reigned but were often vassals to greater political empires. Sadly, the era following the great Maccabean uprising is one known for corruption and treachery. The Maccabeans began their reign just as a powerful new empire was emerging: Rome. Julius Caeser was born in the year 100 BCE. Just 100 years after the Maccabean victory, Pompey brought the Roman army into Judea at the invitation of Hyrcanus and Aristobolus, the two Hasmonean brothers who were vying for the throne. It was the beginning of a very sad ending to an inspiring victory! This Treat is posted each year in honor of Chanukah. Have you ever heard of Yehudit (Judith), the daughter of Yochanan the High Priest, who saved her city, Bethulia, from destruction at the hands of the Syrian-Greek general Holofernes? As the Jews in the town neared starvation due to the enemy siege, Yehudit told the elders that she had a plan to deliver the enemy into their hands, but they must not ask her about it. They must simply have faith in her. Knowing her reputation for wisdom and piety, they agreed. Accompanied by one maidservant, Yehudit managed to gain an audience with Holofernes and told him that, for the sake of those suffering from the siege, she wanted the city to fall. She proposed to report to him, daily, on the town’s supplies and let him know when was best to strike. After several days, Yehudit felt that she and her maidservant had gained the trust of the enemy. They came and went as they pleased. When she told Holofernes that the city had no food left and that it would be good time to strike, he invited her to come alone to his tent to celebrate. She agreed, insisting that he partake of her ‘renowned’ goat-cheese. As he ate the salty cheese, Yehudit quenched his thirst with the heavy wine that she had brought with her. When Holofernes finally fell into a stupor from too much food and drink, Yehudit cut off his head with his own sword. The two women wrapped the head in a cloth and returned to Bethulia. Yehudit instructed the Jewish elders to attack the Syrian-Greeks immediately. The Syrian-Greeks soldiers awoke to find the Judeans attacking and their leader mysteriously dead. The Syrian-Greek army fled in confusion and panic. In honor of Yehudit, there is a custom to eat dairy on Chanukah. Clean your menorah before putting it away. While Jewish holidays are known for their food (except Yom Kippur, of course), most of these foods are not known for being particularly healthy. Chanukah is no exception. Forget matzah or apples, those are healthy in comparison--pull out your deep fryer, because Chanukah is a celebration of oil. 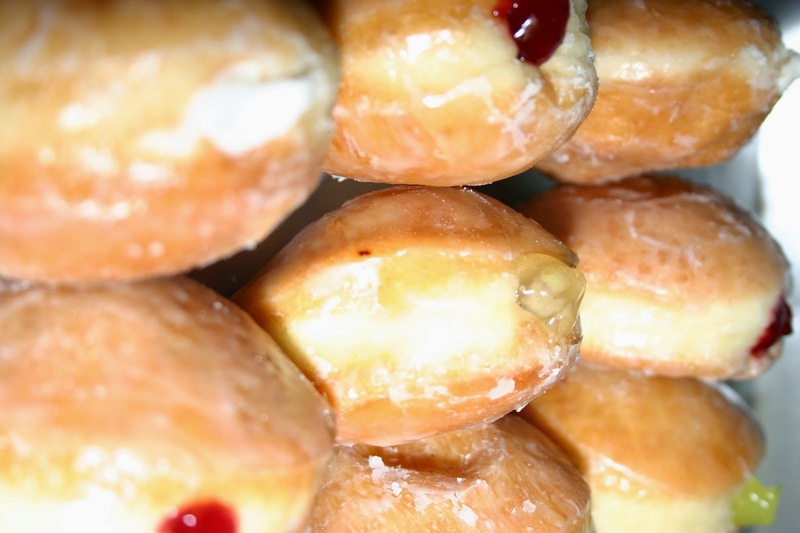 Soufganiyot (that’s Hebrew for doughnut): Did you know that Homer Simpson’s favorite treat is a traditional Chanukah delight in Israel? Deep fried dough, most often filled with a pinch of jelly, is how Israelis celebrate the tiny cruse of oil found by the Maccabees. 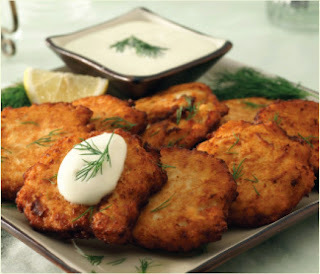 This tradition probably developed from the custom among some Sephardi Jews to celebrate Chanukah with bimuelos, which are best defined as a type of fritter. Latkes: (That’s Yiddish for pancake, in Hebrew they are called levivot): Read any children’s Chanukah book today and you’ll find descriptions of pancakes made of grated potato sizzling away in oil. But, potatoes were only introduced into European society in the 1500s (they originated in South America). Prior to the introduction of the potato to the latke, Ashkenazi Jews celebrated Chanukah with cheese latkes. Same basic idea, yummy food fried into pancakes. Dairy, however, has its own special connection to Chanukah. Dairy foods were eaten as reminder of Judith (Yehudit), who, according to tradition, was a beautiful widow who beheaded an enemy general by plying him with cheese and wine until he fell asleep (read the complete story here). Happy Chanukah. Now get out the griddle and enjoy! Mattityahu (Mattathias): A High Priest descended from the Hasmonean line, Mattityahu lived in Modi’in with his five sons. Mattityahu started the rebellion against the Syrian-Greeks when he refused to sacrifice a pig to a Greek god and then slew the Jew who volunteered to do so. Yochanan (John) Gaddi: The oldest son of Mattityahu fought alongside his brothers. His death at the hands of the sons of Jambri from Medeba (in Moab, now Jordan) is recorded in the first Book of Maccabees. Shimon (Simon) Thassi: The second son of Mattityahu, Shimon fought alongside his brothers. He was the first ruler of the Hasmonean Dynasty, who came to power around 142 B.C.E, and also served as the High Priest. Yehuda (Judah) Maccabee: The third son of Mattityahu, Yehuda was the recognized leader of the revolt after his father’s death (about a year into the revolt). He is considered one of the greatest Jewish warriors in history. After the capture of Jerusalem and the rededication of the Temple, Judah continued to lead the battle against the still occupying Syrian-Greeks. The battles continued even after Yehuda’s death in battle in 160 B.C.E. Elazar Avaran: The fourth son of Mattityahu was killed during the initial rebellion. The Syrian-Greeks had a cavalry of elephants. Elazar ran under one elephant and cut open its belly, but was unable to escape from under the animal before it collapsed on top of him. Experiment by making latkes with different ingredients. The weekly Torah reading of Miketz (Genesis 41:1-44:17), which almost always coincides with Chanukah, tells the story of the rise of Joseph, the son of Jacob, from slave to viceroy. And while Miketz contains no Jewish oppression, no battles, and no outright miracles, Joseph’s story could well be viewed as a stark contrast to the story of Chanukah. The story of Joseph is an affirmation of how to remain true to one’s faith while still succeeding in a non-Jewish society. He spoke Egyptian without an accent and pretended not to understand Hebrew. He dressed in royal robes. The people called him by the name Tzaphenath Pa'nayach. Joseph was so well disguised by his Egyptian identity that even his own brothers could not recognize him. Throughout his stunning career, however, Joseph never forgot who he was. When Joseph finally revealed himself to his brothers, he declared: “...for it was to preserve life that God sent me before you” (Genesis 45:5). Joseph recognized that his ability to maintain his faith, while living as an Egyptian, was beyond most people. That is why, when his entire family came to settle in Egypt, he asked Pharaoh to allow them to settle in Goshen as shepherds, separated from the Egyptian people by land and profession. Chanukah celebrates Jewish identity and the determination of the people to fight assimilation. When the Syrian-Greeks conquered the land of Israel, they presented their Hellenistic lifestyle as one that was exalted and universal. But as Jews took on the external affectations of the Greeks--their dress, their language, their names--they did not have Joseph’s strength to eschew the heathen practices that were integral to the Hellenistic lifestyle. Assimilation into surrounding cultures with a corresponding loss of Jewish identity has always been a challenge for the Jewish people. Joseph met the challenge successfully, can we? Chanukah is neither directly ordained in the Torah (like Rosh Hashana, Passover, etc.) nor mentioned in any other biblical text (as Purim is in the Book of Esther). The Books of Maccabees are not included in the Biblical canon, because these events occurred after the sages had declared the Tanach (complete Hebrew bible) closed to further additions (around 250 B.C.E.). Writings, such as the Books of Maccabees, which have historical import but are not included in the Tanach, are often referred to as Sfarim Chitzonim (external books) or by the Greek term Apocrypha (hidden books). While Maccabees I was originally written in Hebrew, only the Greek translation survives (although it has been re-translated from Greek into Hebrew). Maccabees I is a historical work that describes Antiochus Epiphanes’ assumption of the Selucid throne (175 B.C.E. ), the actions of the Jewish Hellenizers, and, in detail, the revolt of the Maccabees. The book concludes with the death of Simon the Hasmonean (Maccabee) and the appointment of his eldest son, John Hyrcanus, as ruler (135 B.C.E.). Maccabees II was written in Greek, and, in the style of Greek historians, is full of drama and rhetoric. Focusing mainly on the deeds of Judah Maccabee, the leader of the rebellion after the death of Mattitiyahu, Maccabees II also includes details of the actions of the Hellenizers (power-plays and bribery were a serious problem in the priesthood at the time) and acts of sacrifice and martyrdom by those dedicated to keeping the Jewish faith. While Maccabees III and Maccabees IV are sometimes grouped together with the first and second books mentioned above, neither of them are accounts of the events of Chanukah, nor are they accorded the same historical veracity as Maccabees I and II. 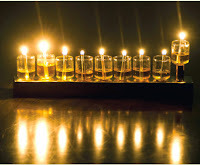 Light your Chanukah menorah before your Shabbat candles and use large candles/more oil to make it last into Shabbat. What does Noah’s son Yephet have to do with the story of Chanukah and the mitzvah of circumcision? When the Syrian-Greeks sought to force Hellenization on the Judeans, one of the first mitzvot they outlawed was brit milah, circumcision. In fact, performing a brit milah on one’s child became a capital crime. The Syrian-Greeks found circumcision particularly offensive because of their own culture’s devotion to the beauty and perfection of the human body. The ancient Greeks are renowned for their sculptures and naked athletics. From the perspective of Hellenistic culture, the male body represented perfection. It was, therefore, unconscionable that the Jews should alter it, or maim it, especially by Divine decree. The Greeks are known in the Bible as “Y’vanim,” the people of Yavan. They are, according to the sages, the direct descendants of Yavan, the son of Yephet, the son of Noah. Noah had three sons: Yephet, Ham and Shem. Very little is written about Yephet other than the fact that, following Shem’s lead, Yephet covered his father’s nakedness, which had been exposed by Ham. For this noble act, Yephet is praised. (See Genesis 9).There is, however, much one can learn about a biblical personality through his/her name. The name Yephet derives from the Hebrew root (y-ph-h), which is the base of the word Yafeh, beautiful. Thus, beauty, and the admiration of beauty, are part of Yephet’s nature. Consequently, Noah blessed him: “May God grant beauty to Yephet, and may he dwell in the tents of Shem” (Genesis 9:27). Yephet is associated with beauty and adoration of the human body, the two cultural traits that came to define Yavan-Greece. Perhaps, then, it is not so surprising that they abhorred the dedication of the Jews to the mitzvah of brit milah. Then will I complete, with song and psalm, the altar's dedication. Maoz Tzur is one of the best known Hebrew piyyutim (religious songs/poems). Most people, however, are only familiar with this first verse (there are 5 more verses--click here to read the entire song). Thought to have been written in the 13th century, it has become a near universal custom to sing Maoz Tzur after lighting the Chanukah candles. The author of Maoz Tzur, a man known only as Mordechai (the letters of his name serve as an acrostic of the first letters of the first five stanzas), focused on each exile in order to acknowledge the redemption that God has brought the Jewish people in the past and to pray for a speedy redemption in our own day. *Translation reproduced with permission from The Koren Sacks Siddur, © Koren Publishers Jerusalem Ltd.
Prioritize values of kindness, thoughtfulness and morality over physical beauty. These lights we kindle upon the miracles, the wonders, the salvations and on the battles which You performed for our ancestors in those days in this season, through Your holy priests. 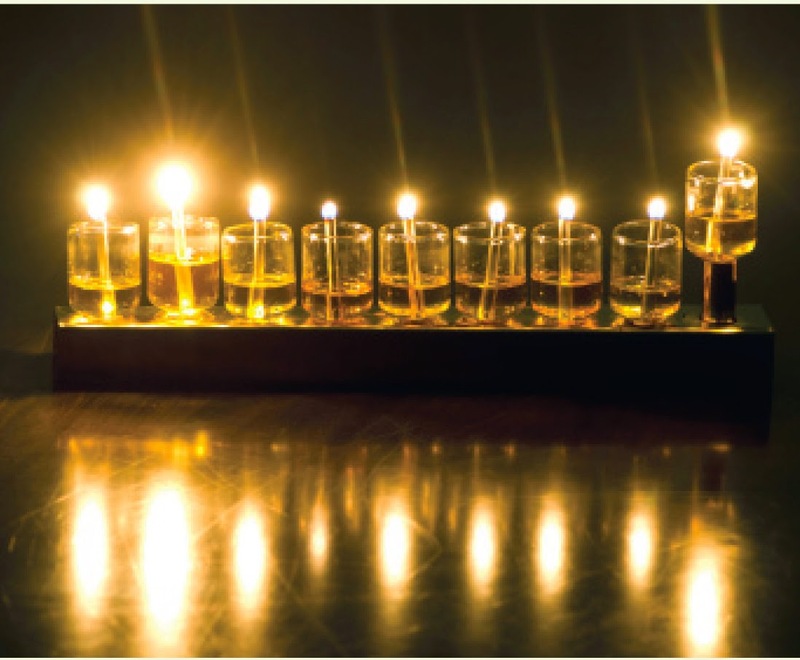 During all eights days of Chanukah, these lights are sacred. We are not permitted to make ordinary use of them, but to look at them, in order, to express thanks and praise to Your great name for Your miracles, Your wonders and Your salvations. Ha’nayrot Halalu reminds us that there are many extraordinary events within the celebration of Chanukah. There are the miracles, such as the single flask of oil lasting eight days instead of one. There are wonders, such as the fact that there remained even one single flask of pure olive oil still sealed by the High Priest. And there are salvations, such as the incredible courage of the small Jewish army to go into battle while so severely out-manned and their ability to overthrow the soldiers of the mighty Syrian-Greek empire. Additionally, Ha’nayrot Halalu contains a reminder, that while there are no restrictions on one’s actions on Chanukah (as there are on the Biblical festivals of Passover, Shavuot, Sukkot, Rosh Hashana and Yom Kippur), one must not forget that the days of Chanukah are holy as well. Thus it is that one may not use the Chanukah candles for any purpose other than as a reminder of the many ways of God’s salvations. With dreidel I shall play! Nun: Nothing happens, on to the next player. Gimmel: The player wins the pot. Hey: The player takes half the pot. Shin: The player must put a coin/candy in the pot. Gambling?! On a Jewish holiday? When the Syrian-Greeks ruled Judea (c. 167 B.C.E. ), they banned the study of Torah. The Jewish people defiantly continued to study and to teach their children. Under the threat of death, the children and their teachers met in secret, with a lookout to watch for soldiers. When the enemy approached, the books were quickly hidden and the Jews pretended to be gambling. The letters on the Chanukah dreidel spell out Neis Gadol Hayah Sham, A Great Miracle Happened There (referring to Israel). In Israel, therefore, dreidels have a Pey instead of a Shin, representing the word Poh, which means Here, since the miracle actually occurred in the land of Israel. So go ahead, gather a few friends, spend a few pennies and spin the dreidel without any guilt. Make Chanukah fun and delicious - use chocolate candies for playing dreidel. Chanukah always overlaps with at least one Shabbat (if not two), and since Chanukah begins on the 25th of Kislev and lasts for eight days, the holiday always coincides with the celebration of Rosh Chodesh (the new month of) Tevet. (Rosh Chodesh is celebrated Saturday, 30 Kislev, and Sunday, 1 Tevet.) This is significant because both Rosh Chodesh and Shabbat were loathed by the Syrian-Greeks and their observances were outlawed. The very first commandment that the Jewish people received as a nation - "This month shall be yours as the first of months" (Exodus 12:1-2) - instructed the Jews to sanctify the beginning of each new month. The Syrian-Greeks felt threatened by the Jewish concept of Divinely ordained time, since the sanctification of the month was based on the sighting of the new moon, rather than by a humanly calculated number of days. The Syrian-Greeks were against the observance of Shabbat, not because it sanctified time, but because it was a day of rest, a day of no creative labor. The commandment of Shabbat states: "Six days shall you work and do all your labor, but the seventh day is Shabbat for the Lord your God. On it, you shall do no [creative] work" (Exodus 20:9-10). This contradicted the essence of Hellenistic culture, through which the Syrian-Greeks proclaimed their control over the world. The Jewish idea of taking one day off to demonstrate belief in God’s control of the world negated the Syrian-Greek belief in the ultimate power of the individual.That the Jews held fast to their belief in one unseen God who knows and controls the entire world infuriated the Syrian-Greeks, who wished to show that humankind was in control of nature. The Syrian-Greeks therefore prohibited the Jews, under penalty of death, from sanctifying the new moon (Rosh Chodesh) and keeping the Sabbath. "One who is diligent in lighting Chanukah candles will have children who are scholars" (Talmud Shabbat 23b). 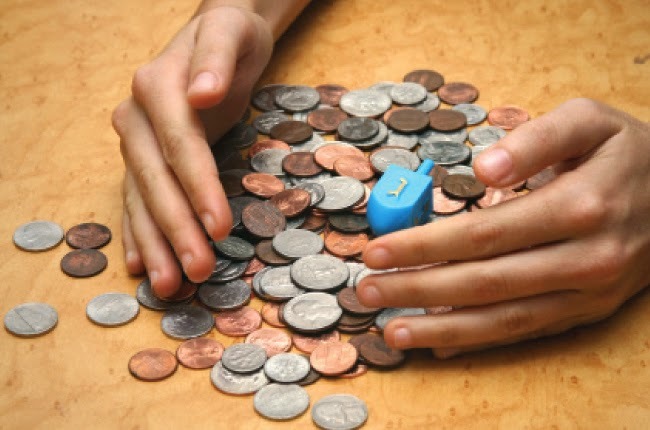 The desire for scholarly children was actually one of the motivations for the custom of giving Chanukah gelt (money). In modern times, money has been replaced by Chanukah presents. What is the connection between Chanukah lights, intelligent children and gelt? Publicizing the miracle of Chanukah is so important that even a pauper, who has no money at all, is required to borrow money in order to buy oil for lighting. People therefore began to give a little money (gelt) to the poor so that they would not be embarrassed or forced to ask for assistance. Because the idea of "being diligent in lighting the Chanukah lights" is primary in both giving to the poor and meriting wise children, it became the custom to give children gelt as a reward for studying. Children who were diligent in their studies were rewarded with a shiny coin. While gifts are an offshoot of the holiday, they represent an important element of Chanukah--chinuch, Jewish education. The Maccabees fought so that their children and their children's children would be able to study Torah freely and be knowledgeable about their Jewish heritage. Jewish children are taught about Judaism not only for today, but for posterity as well, as it says in Proverbs 22:6: "Educate a young person in his/her own way, when he/she grows old he/she will not turn from it." Over time, the simple practice of giving gelt (coins or presents) became a Chanukah custom - and not just for children. In truth, however, it is not surprising that gift giving has moved beyond just children. In our own day and age, we, the adults, also need encouragement to learn about who we are and what our Jewish heritage means. If you don't already have one, print or purchase a calendar marking the Jewish months. It is not uncommon to find that significant events in Jewish history occurred in different years but on the same day on the Jewish calendar. For instance, Tisha B'Av (9th of Av), the day on which we mark the destruction of both the First and Second Temple, occurred on the same calendar day on which the Israelites in the wilderness listened to the spies and cried out in fear that God was leading them to their deaths. This resulted in 38 additional years of wandering in the wilderness before the next generation was allowed to enter the Promised Land. Today is the 25th day of the Hebrew month of Kislev, and the first day of Chanukah. Chanukah is celebrated on the anniversary of the rededication of the Second Temple by Judah Maccabee and his loyal followers. According to Jewish tradition, however, it is not a coincidence that this event occurred on the 25th of Kislev. According to the Talmudic sage Rabbi Chanina, the construction of the Mishkan (temporary Tabernacle that was used before the permanent Temple was erected) was completed on the 25th of Kislev. Once the Mishkan was completed, however, Moses waited until the 1st of Nissan for its official dedication. The postponement, according to the Midrash, was because "God wanted to celebrate the rejoicing of the Tabernacle in the month in which Isaac was born (Nissan)...Kislev thus forfeited [the honor] though the work had been completed [during that month]. God therefore said: 'I will make restitution.' How did God repay Kislev? With the Chanukah (inauguration) of the Hasmoneans (Maccabees)" (Yalkut Shimoni, Melachim 184). Because the Chanukat Ha'Mishkan, the dedication of the Tabernacle, did not occur on the day it was completed, the great honor of the miracle of Chanukah was reserved for the 25th of Kislev. On Purim, the text describes Haman’s evil decree to “destroy, slaughter and annihilate all the Jews, young and old, infants and women.” Rather than describe the rest of the events narrated in the Book of Esther, the Purim Al Hanisim then praises God for the way in which he “foiled his [Haman’s] counsel and frustrated his intention.”Click here to listen to a musical rendition of Al Hanisim. 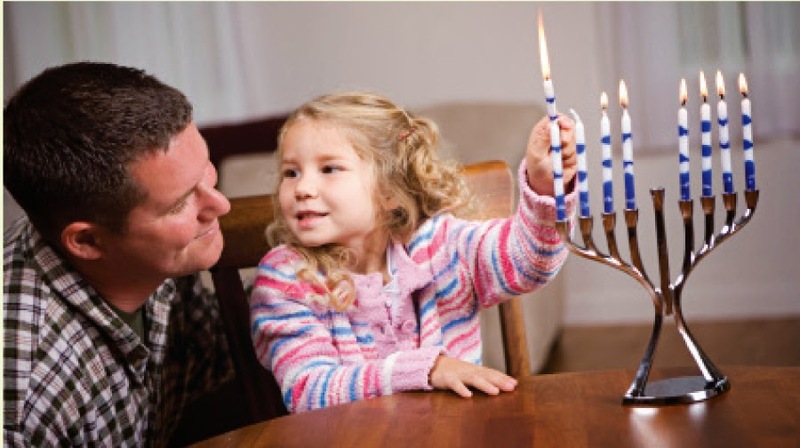 Let the holiday of Chanukah be an inspiration to dedicate yourself to include more Jewish learning in your daily life. The term menorah is used for both the classic symbol of the holiday of Chanukah and the great seven-branched candelabra that was built in the wilderness following explicit Divine directions and used first in the Tabernacle and later stood in the Holy Temple in Jerusalem. In order to make a distinction between these two menorot, the term chanukiyah is sometimes used in reference to the Chanukah menorah. 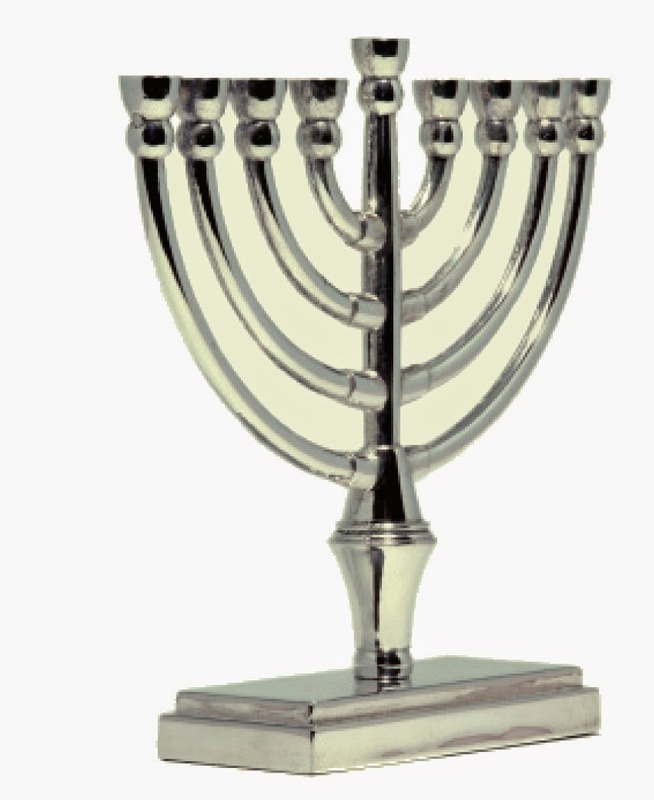 It has nine branches - eight lights for Chanukah and a shamash, a "helper" candle to light the other candles. 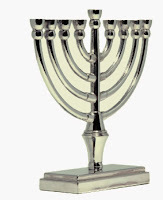 1) You really don’t need a chanukiyah (or a menorah)! That’s right, one could technically light a series of tea lights (for example) one next to the other and still properly fulfill the mitzvah of Chanukah lights. 2) The lights should be in a straight line without any difference in height between any of the Chanukah lights. They may be in a semi-circle as long as all the lights are visible at the same time. The place for the shamash on the chanukiyah, however, should be differentiated from the other lights. Usually it is higher, lower or out of line with the others. 3) There should be enough space between lights so that none of the flames merge with their neighbor. Also the candles must be far enough apart that one candle does not cause the candle next to it to melt. 4) It is preferable to use olive oil for the Chanukah lights since the miracle took place with olive oil. One may, nevertheless, use wax or paraffin candles or other types of oils as long as they produce a steady, clean light. The Jewish people have said this prayer daily for thousands of years.On the first night of Chanukah, one candle/wick in oil is placed on the far right of the menorah. Each succeeding night, one candle/light is added to the left of the previous night's candle(s)/light(s). The newest candle/light is always lit first. Ba'ruch ah'tah Ah'do'nai, Eh'lo'hay'nu melech ha'o'lam, ah'sher kidishanu b'mitz'vo'tav v'tzee'vanu l'hahd'leek nayr shel Chanukah. Blessed are You, Lord our God, King of the Universe, who has made us holy through His commandments, and has commanded us to light the Chanukah light. Ba'ruch ah'tah Ah'do'nai, Eh'lo'hay'nu melech ha'o'lam, sheh'asah neesim la'avotaynu, bayamim hahem bazman hazeh. Blessed are You, Lord our God, King of the Universe, who wrought miracles for our ancestors in those days at this season. The third blessing is recited only on the first night. Ba'ruch ah'tah Ah'do'nai, Eh'lo'hay'nu melech ha'o'lam, sheh'heh'cheh'yanu v'kee'manu v'hee'gee'anu la'zman ha'zeh. Blessed are You, Lord our God, King of the Universe, who has kept us alive, sustained us, and brought us to this season. This Treat is reposted in honor of Chanukah.